As you know, at The Neon Leopard, we are all about the group buying websites. You’ve seen them…GroupOn, TeamBuy, DealTicker etc. They are an incredible way to try new restaurants, products and experiences around the city at a discounted price. There are almost too many group buying sites to keep track of, with new ones popping up all the time. Another thing we are all about at TNL, is putting you on to helpful things that we discover. If you love the vouchers, buys and deals that group buying sites will get you , but find it time-consuming to comb though the sites or daily emails, you may want to try OneSpout. One Spout takes all of the daily group buying deals and aggregates them, then funnels them through ” one spout” on to their website. 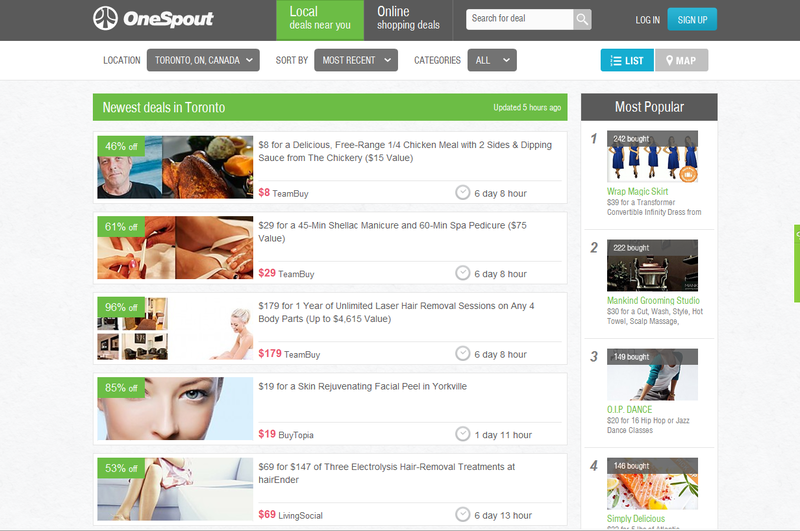 You simply enter your city , postal code, or address and One Spout will list all of the deals. Or, you can view a map with deals plotted by neighbourhood. You can also limit the deals to local or online offerings. Users can use OneSpout without registering , or sign up to have your settings remembered and receive a daily e-mail with a list of your deals. They collect deals from over 300 sites so you can imagine all the scouting this saves. Ash has even used the site to find affordable dining deals for visiting a friend in Las Vegas! The only problem with OneSpout is that it makes finding deals so easy and effortless, that you just want to buy them all. Have you used OneSpout before? Me too! I ‘m sure I bought fro yo coupons and haven’t used them yet either. I don’t buy a lot of the deals, but some pretty good ones come up so it’s nice to get the e-mails just in case. You never know when there will be one that is exactly what you are looking for.